Katy Tromans, a 3D print and CAD technician at Weston Beamor, is a woman of many talents. 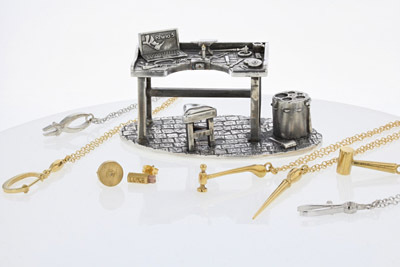 In addition to her work at Weston Beamor, Katy is a prize-winning silversmith recently awarded a Gold Medal for her CAD presentation in the prestigious Goldsmiths’ Craft & Design Council Awards. 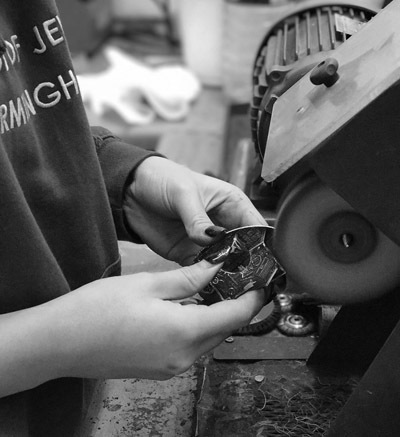 Katy is also Artist in Residence at the School of Jewellery at Birmingham City University, where she trained. Her latest work will shortly go on display in the ‘One Year On’ alumni exhibition being staged by BCU at its Park Side Gallery from Monday 12th of June to Friday the 30th of June. 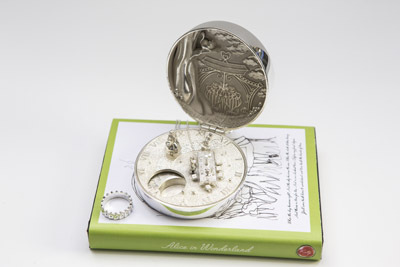 “I shall use the exhibition to showcase the ‘Alice in Wonderland’ piece for which I won the Goldsmiths’ Craft Award, together with two new collections entitled ‘Home is where the Bench Is’ – which is all about jewellery making, and ‘One Stitch at a Time” which is for sewing enthusiasts,” Katy explains. 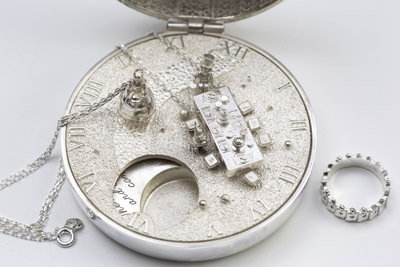 Katy describes her work as ‘objet d’art’ and all of her collections feature a sculptural hero piece – a pocket watch inspired design for Alice in Wonderland, and a jewellers’ bench and a sewing scene with wearable dressmaking busts, for the two new collections. These are not purely decorative and can also be used to store the jewellery when it is not being worn. “I have had great support from the team at WB in bringing these very complicated and detailed designs to completion and I have learnt a huge amount in the process, knowledge which I can now hopefully pass onto our customers,” says Katy.